Cortona, Italy – the epitome of Tuscan beauty. Maze-like cobblestone streets, an enoteca around every corner, panoramas of sweeping sunflower fields, cozy cafés and austere churches. This hilltop town is everything you fantasized your vacanza in Toscana to be. Although unassuming, the quiet hill town has attracted thousands of years of attention thanks to her fertile land and idyllic setting. In recent history, Frances Mayes drew the Tuscan hill town to the attention of romantics and broken-hearted divorcées in her best seller turned film Under the Tuscan Sun. However, she was not the first to romanticize Cortona. Legends of the town have been woven over the past two millennia. Ancient scholars and poets go so far as to claim that the fertile Valdichiana was so beautiful, that it attracted the likes of Noah and Ulysses – both choosing the area as their temporary homes. A modern-day Italian music legend – Jovaonnti – calls Cortona home as well (think Bono with an Italian accent). An easy train ride away from Florence, we highly recommend that you see for yourself the Tuscan town that has been breaking hearts for thousands of years. 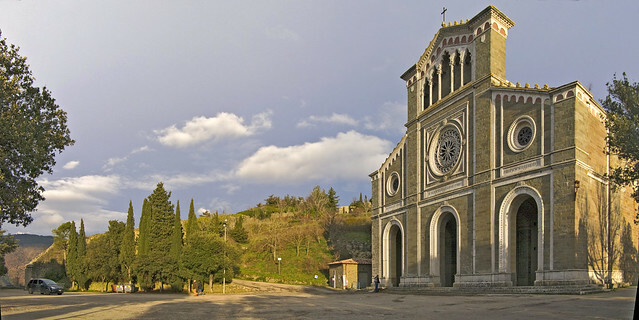 From Florence, catch a regional train to Camucia-Cortona. The ride is an easy 1 to 1.5 hours and tickets cost approximately 10 euro each way. Your stop is in Camucia, the small town that sits in the shadow of Cortona at the base of the hill. Taxis and buses frequent the train station to bring tourists up to town (10 minute ride). If you’re in a hiking mood, a 4 kilometer, uphill climb awaits you (no thanks!). In my opinion, the Via Santa Margherita is one of the most beautiful walks in all of Tuscany. The cobblestone roads guide you along the ancient city wall, offering breathtaking views of the Valdichiana below. On the road, look for the church of San Marco where you can admire the mosaics on the facade designed by Futurist artist Gino Severini. Servini sets the tone for the walk, as tabernacles depicting the Stations of the Cross, designed by the artist, line the via leading to Santa Margherita. The cobblestone path will take you directly to Piazza Santa Margherita which sits at the tippy top of town. 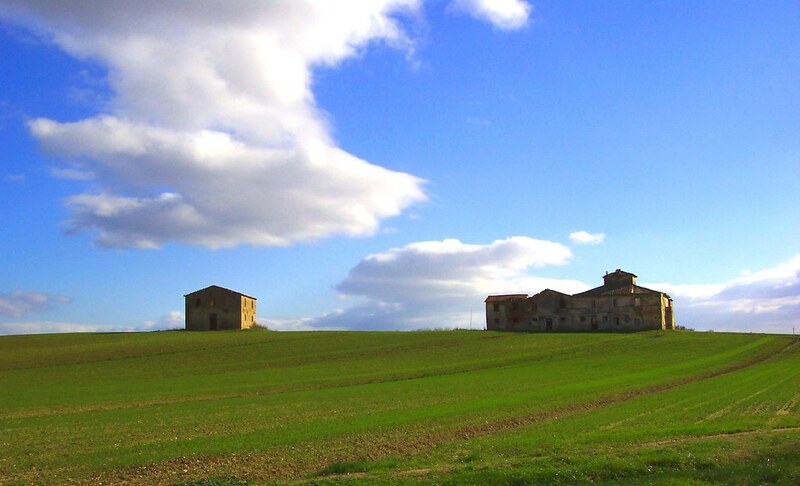 The first church on this site was built in the 11th century by the Camaldolesi monks. When the church was damaged in the sack of 1258, Cortona’s own St. Margaret had the church reconstructed. St. Margaret died in a small room in the back of the church 9 years later. Upon her death, the town commissioned artist and architect, Giovanni Pisano, to construct the basilica you see today, in honor of Santa Margherita. Enjoy the views of Via Santa Margherita even more as you descend the path back into town. Via Santa Margherita will take you straight back on to Via Nazionale – Main Street. Take a lazy stroll down the strada, popping into galleries and cafés along the way. My completely unsolicited favorite, is a small photography gallery on a side street called Il Pozzo. The exceptionally friendly owner welcomes admiring eyes, even if you can’t swing a purchase. Make sure to ask him where he keeps his fish collection – spoiler alert – they can be found in an ancient Etruscan well in the shop. Via Nazionale will lead you to the main square of town – Piazza della Repubblica. The centerpiece of the piazza is the Palazzo del Consiglio Comunale (aka town hall) built in the 12th century atop the ruins of the ancient Roman forum of Cortona. Ready for a little less history and a little more people watching, we say now would be a perfect time for lunch – and we know just the spot for our favorite penny-pinching travelers. On the north side of the piazza is a Despar grocery store – perfect for a quick, easy and inexpensive sandwich from the deli. After you’ve purchased your picnic lunch, we recommend claiming a seat on the steps leading to Palazzo Comunale or venturing up to the public terrace (just above the grocery store) that overlooks the piazza. Watch nonni gather to discuss neighborhood gossip, Italian men purchase bundles of sunflowers for their wives, and the wanderlust (such as yourself) in awe of this absolutely perfect place. Have you ever had a happier lunch? After lunch, head to the right of Palazzo Comunale which will take you to the adjacent Piazza Lucca Signorelli. Continue straight through the piazza to find two roads – one that forks right and one left. Head left. 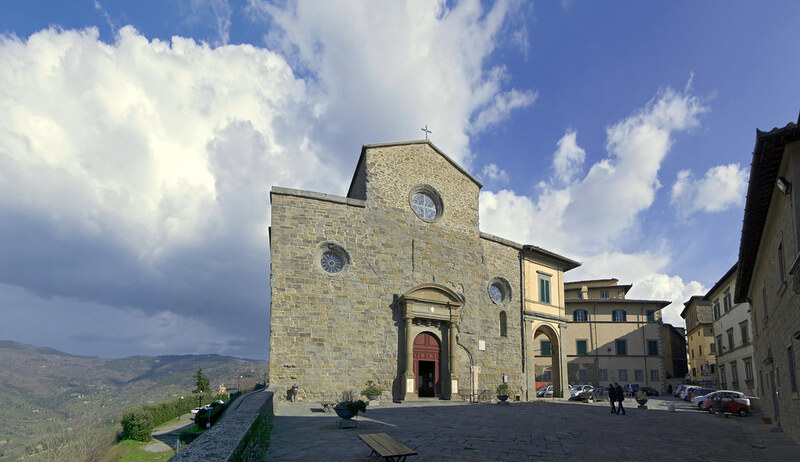 A quick two-minute stroll will take you to the Cathedral of Cortona. The original structure was built when Christianity was still just a baby in the 4th century. The Romanesque structure we see today has gone through centuries of renovations. Peek inside the interior for a glimpse at art by some of Cortona’s greatest artists – such as Pietro da Cortona. To the right of the Cathedral is the historic home of the Bishop, as the Cathedral was named the seat of the bishop in the 14th century. Oh yeah, don’t forget to check out the absolutely spectacular views that the church overlooks. Santa Maria Nuova Head back to Piazza Lucca Signorelli. This time, take the other other side of the fork (immediate left when you enter the Piazza on your way back). Follow the road north for three minutes until you have exited the old city wall. The street will bring you to a stunning overlook from which you can view the church. Santa Maria Nuova was built by Florentine favorite – Giorgio Vasari – in the late 16th century. Designed in a Greek cross plan, and situated in the hills, away from the city, the structure departs from the typical Italian church circuit and is a true sight for sore eyes. Beyond Santa Margherita is the Medici fortress, built in the 16th century as Grand Duke Cosimo fortified his newly acquired kingdom. Views are striking, exploring is encouraged, and picnics are a must. This isn’t the first time we at Florence for Free have recommended a visit to a cemetery and probably won’t be the last. The cemetery of Cortona, to the west of Santa Maria Nuova is a beautiful city of shrines and mausoleums in a Tuscan oasis of cypress trees and olive groves. Cortona Cemetery by Craig D.
A day in Cortona is something that everyone needs at least once in their lives. Cortona awakens and intoxicates every sense and reminds us how to appreciate true beauty. 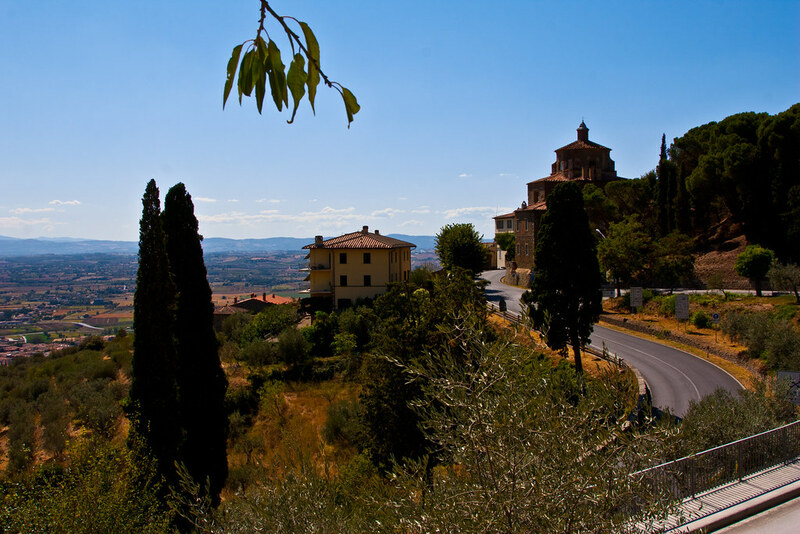 Suddenly, Under the Tuscan Sun makes much more sense – who needs a man, when there is Cortona?! **A special thanks to one of our best gal pals and members of the FFF squad, Shannon, for first introducing me to the magical town of Cortona. 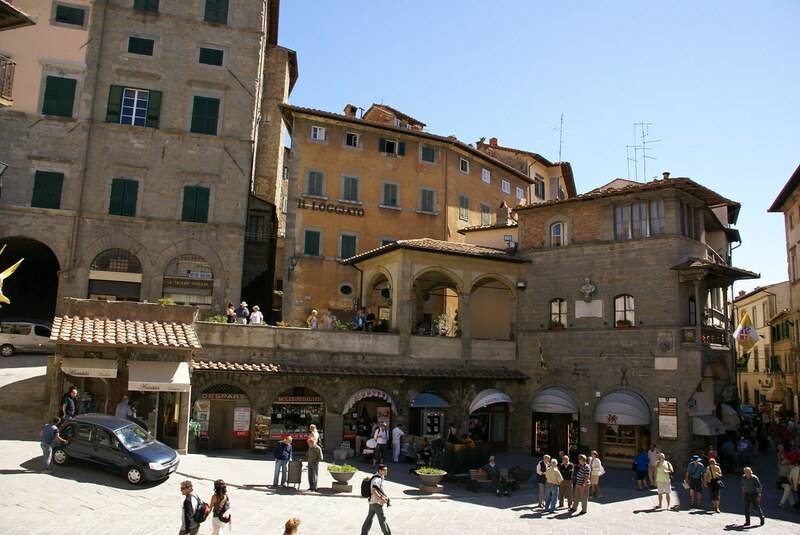 Having lived in Cortona, Shannon provided expert advice and inspiration for this post. Thanks for these details about the town that I aim to visit after having seen the video of Andre Rieu’s concert in Cortona.